Pasay City – The Technology Application and Promotion Institute of the Department of Science and Technology (DOST-TAPI) showcased the most outstanding local inventions and researches on 14-16 August 2018 at the 2018 National Invention Contest and Exhibit (NICE) in Le Pavillon Metropolitan Park, Pasay City. The 2018 NICE, one of the leading programs of DOST-TAPI in technology promotion, is an every-other-year activity which features the Filipino's innovative creativity by giving due acknowledgment and appreciation to the best inventions, innovations, and researches in the Philippines. "Technological innovations contribute to business sophistication and market competitiveness in the local and global settings which then drive economic growth, and more importantly, ease the lives of our people in various activities," said DOST Undersecretary for Regional Operations Brenda Nazareth-Manzano during the 2018 NICE Opening Ceremonies. "NICE has touched and changed the many lives of our Filipino inventors from budding, maybe struggling individuals to powerhouse names in the market, since NICE was launched," added Nazareth-Manzano. Filipino inventors and researchers competed for six categories including Outstanding Invention (Tuklas) Award, Outstanding Utility Model, Outstanding Industrial Design, Outstanding Creative Research (Likha) Award, and Outstanding Student Creative Research (Sibol) Award for high school and college students. Tuklas Award is given to the most outstanding invention which demonstrated potential qualities for commercialization. Outstanding Utility Model and Outstanding Industrial Design, on the other hand, are given to outstanding new models and outstanding new, original, and ornamental design for manufacture, respectively. Moreover, Likha Award is awarded to a research and development (R&D) activity which poses potential to develop into a relevant and commercially viable technology for possible adoptors. Lastly, Sibol Award is given to the most outstanding invention or creative research of high school and college students. 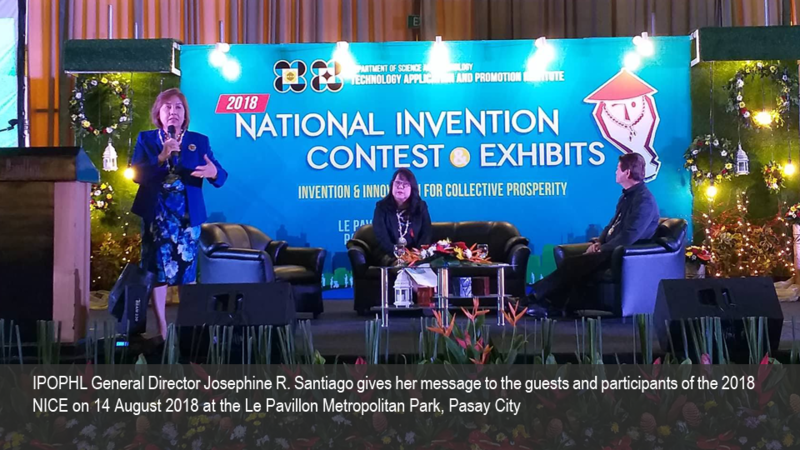 Intellectual Property Office of the Philippines (IPOPHL) Director General Josephine R. Santiago emphasized the important role of intellectual property (IP) in inventions and innovations during the Opening Ceremonies. "IP is at the core of the Fourth Industrial Revolution as it was in the preceding revolutions because it signifies that the technology consisting of products, processes, improvements, or combination of these, is a solution to a problem in any field," said Santiago. 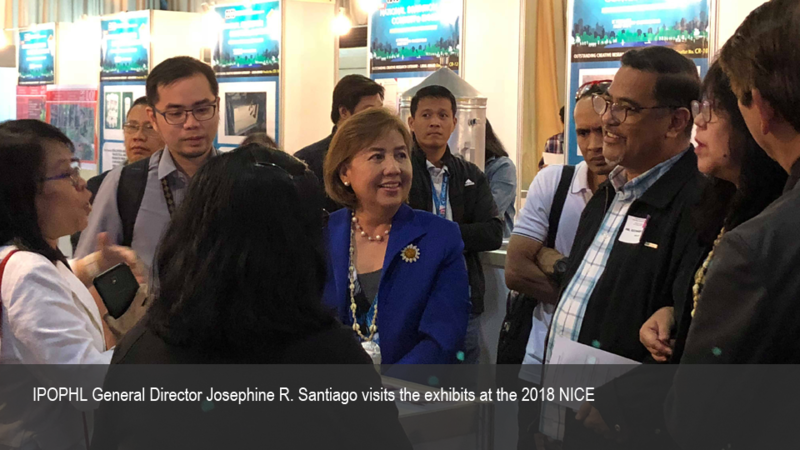 The qualifiers of the 2018 NICE were scrutinized by a prestigious panel of judges who visited their booths and asked questions about their inventions and researches. The Tuklas First Prize Awardee took home Php300,000.00, plaque and certificate of recognition from DOST-TAPI, and gold medals from the World Intellectual Property Office (WIPO) and International Federation of Inventors' Associations (IFIA) while the Outstanding Utility Model and Outstanding Industrial Design First Prize Winners took home Php200,000.00, plaque and certificate of recognition from DOST-TAPI, and WIPO and IFIA gold medals each. Likha and Sibol First Prize Winners were given Php100,000.00 and plaque and certificate of recognition from DOST-TAPI each.